After the unexpected loss of our cat Oscar we decided to get a kitten as our home didn't feel right without him. Our girl cats were missing him. We booked to see the kittens but in the meantime Brian aka Francis appeared in the site. It was like an omen as he was the image ofour recently departed Oscar. After much deliberating on the day we reserved Eric, we also booked to see Brian. It was love at first sight - this huge bundle of fluff kept into our arms and purred, rolled around in our arms and climbed from shoulder to shoulder! His Fosterer said it was more loves than he'd ever given her. He'd chosen us and we couldn't wait for ourhome visit. He'd just settled in when our adorable bundle of mischief arrived. Eric is a toast fiend! He doesn't bat an eyelid at any normal kitty treats but don't turn your back on a slice of toast - but only wholemeal not white oddly enough!!! 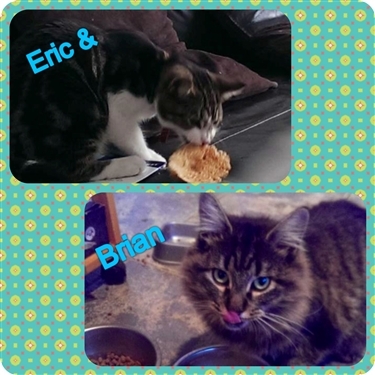 Four cats is a handful but we’d not be without them, especially as Brian and Eric are nowinseparable. Fate showed us Brian whilst we were planning a new kitten. We wanted to support a local cat charity who do an amazing job with all the cats they take in and look after. I've followed them for ages on Facebook and the care time and effort they put into the cats is what really made us choose two Cats Protection cats.